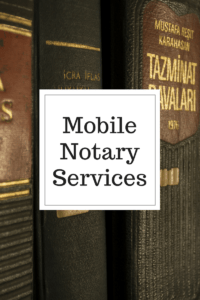 Hawkins Investigations offers Mobile Notary services throughout the Tri-County Area and throughout South Carolina. Hawkins Investigations will send a Notary Public to your location or to your client’s location to notarize documents. Hawkins Investigations can pick up documents to be signed, take them to person that needs to sign documents, notarize documents and return signed/notarized documents. Call Hawkins Investigations at 843-568-2501 for all of your Mobile Notary needs. We are here to serve you and make your job easier.